Imagine this covered in leaves. My family and I have lived in our current house for 15 years. When we first moved in, the trees and bushes were severely in need of grooming. What my husband decided to do was trim everything down low and let it grow back up. So, in the spring, we waited to see what would happen. Quickly, the tree outside our living room window went crazy. 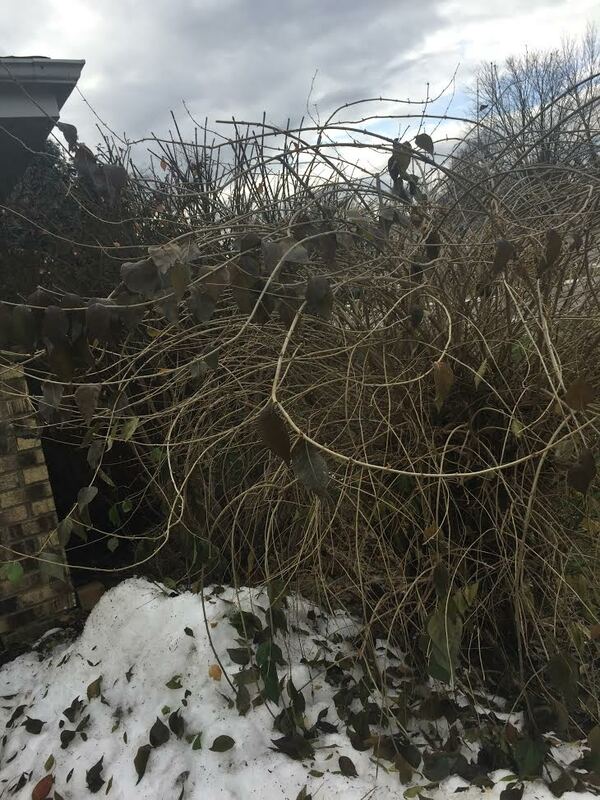 There were limbs and leaves everywhere. We tried to trim it back a bit, but it kept growing back as quickly as we could trim it. Plus, it isn’t one that is easy to trim. Since then, I have had a personal battle with this tree. For some reason I decided that I was going to be the one in control. Well, you might guess how that turned out. I have spent countless hours trimming the tree, only to finish and regret it because it always looked odd. Besides, I could almost hear the limbs and leaves chuckling at me as they grew back. This summer, I followed my usual pattern of attempting to take control of this tree. I trimmed it and then looked out the window and realized how awful it looked. It finally dawned on me that I would never win this battle. I decided I was going to just let the tree do whatever it wanted to do and let it be. Funny how that works when you give up trying to control something. Almost instantly, I saw the tree in a different light. For the first time in all our years living here, I looked out the window and saw that tons of birds found refuge in that mess of a tree. I suddenly started hearing their chirps. Although I was too stubborn to recognize it, nature knew what this tree needed to do. Life is full of lessons on giving up control. Years ago I had to make the exact same discovery with my rheumatoid arthritis. Rather than overthinking every single thing I did in life, wondering if that was the reason I was in pain, I accepted that the pain was a part of my life. With that realization, I was able to look outside of the pain and see the beauty that has come from living with an autoimmune disease: better understanding of self, stronger voice, wonderful friendships, more empathy for others, and much more. As we begin a new year, I hope to continue letting go of things I cannot control and focus on the things I know I do have control over: my blog and advocacy, the part I play in my relationships, improving my overall health, and bringing a positive attitude wherever I go. 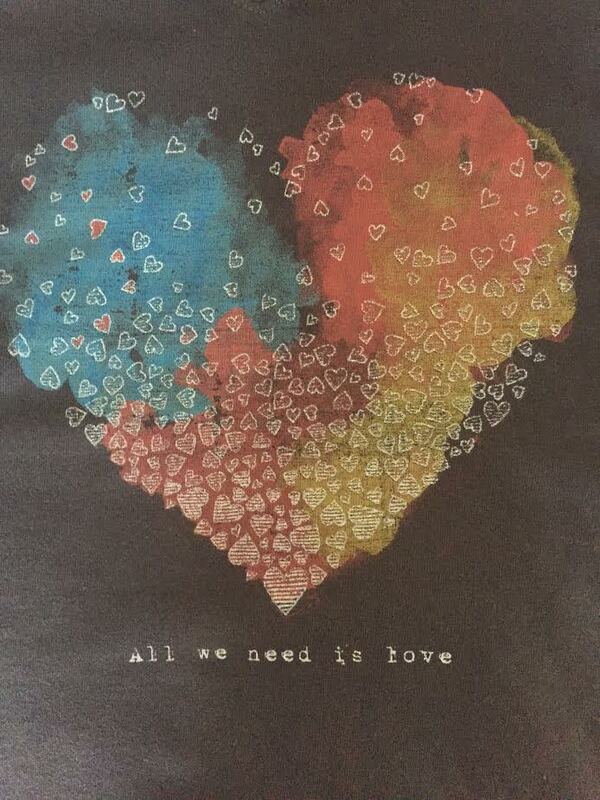 My sister gave me a “Life is Good” shirt this year for Christmas that says, “All we need is love”. Between opening myself to seeing things in a new perspective and focusing on the love I can give to others, nature, my projects, and to myself, I am looking forward to 2017. Happy New Year! Thank you for being a part of my journey in life. What a wonderful story to start the new year. I hope that 2017 brings you and yours much health and happiness. Happy new Year to you and your family as well Cathy. I see so many of us in the Ra community discussing giving things up. I rather think of it as emphasizing what is important, instead of giving things up. I believe I am finding new things that are very important to me with each new year. Still with each new thing I add I do have to leave something behind. I like to think of those things I give up as being those childish things. I tell you sister I have had many childish tings in my life. I am so glad our friendship is not one of them. Nice! I suspect that the emotional connotations around the idea of 'giving things up' are the biggest impediments many people have around re-ordering their lives so that things are simpler – whether they have an illness or not. I also know a great many well people whose lives – from my perspective on the outside – look unnecessarily complicated! Looking at it from the viewpoint of what's workable makes much more sense to me – emotionally AND physically!